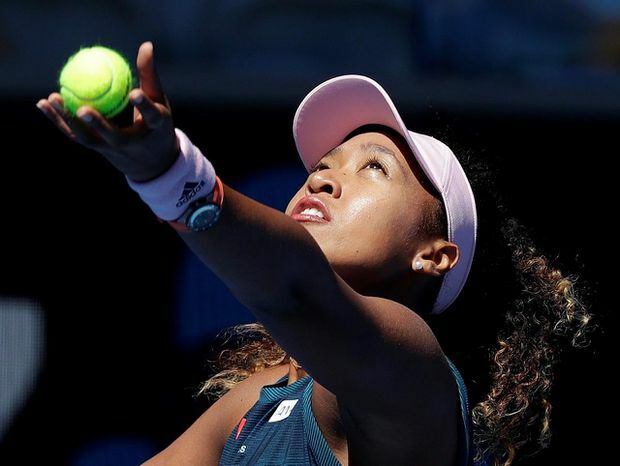 Japan's Naomi Osaka serves to Taiwan's Hsieh Su-Wei during their third round match at the Australian Open tennis championships in Melbourne on Jan. 19, 2019. Naomi Osaka smashed her racket into the court after losing the first set. She tumbled to the court when she tripped in the second. The U.S. Open champion recovered both times and avoided slipping out of the Australian Open on Saturday with a 5-7, 6-4, 6-1 third-round win over Hsieh Su-wei. The fourth-seeded Osaka got a warning from the umpire after she spiked her racket in frustrating when Hsieh took the first set with three breaks of service. To get her mind back on track, she had to pretend like it didn’t happen. The 33-year-old Hsieh, who plays with a double-handed grip on both sides and uses a mixture of spin and slice and drop shots to unsettle her rivals, has taken some top 10 players out of majors before. She reached the fourth round last year here, after beating Garbine Muguruzu, and at Wimbledon, where she beat top-ranked Simona Halep. The 21-year-old Osaka was getting flustered, unable to dictate rallies and seemingly unable to find a way to deal with Hsieh’s unusual style. She found a way back, though, from 4-2 down in the second set when Hsieh was one point away from a 5-2 lead. Osaka got the important break, rallying from 0-40 to win five straight points and converting it with a deep, powerful backhand that Hsieh barely retrieved but can’t keep in play. Hsieh had a breakpoint chance in the next game but couldn’t convert, with Osaka saving it with another backhand winner that reinforced the change in momentum. Apart from the tumble, when she rolled her right ankle early in the game as she served for the second set – she held up her thumb to let everyone know she was OK – Osaka was in control until the end. “Anything that I can do to stay here a bit longer, I tried to do,” said Osaka, who’d never been past the fourth round of a major before last year’s U.S. Open, where she beat Serena Williams in the final. Asked how she managed to get herself back into the contest against Hsieh, Osaka smiled and said it was simple. Sixth-seeded Elina Svitolina had her share of trouble, too. She needed treatment on her right shoulder from the trainer and a medical timeout in the second set and had to rally from 3-0 down in the third set before fending off Zhang Shuai 4-6, 6-4, 7-5 in a match lasting almost three hours. Zhang, who reached the quarter-finals here in 2016 when she was ranked No. 133, needed a medical timeout in the third set but stayed in the contest to the end. She managed to convert a break when Svitolina was serving for the match, and then saved a match point in the last game before netting a tired backhand to finish it. She will next play either No. 17-seeded Madison Keys or No. 12 Elise Mertens in the fourth round. Serena Williams will continue her bid for an eighth Australian title and an Open-era record 24th Grand Slam singles title overall when she plays Dayana Yastremska later Saturday on Rod Laver Arena. A win for Williams on day six of the tournament will set up a fourth-round match against either her older sister, Venus, or top-ranked Halep.